Negotiations are central to the ethos and functioning of the European Union, yet the dynamics of EU negotiations have received far too little systematic scholarly attention. 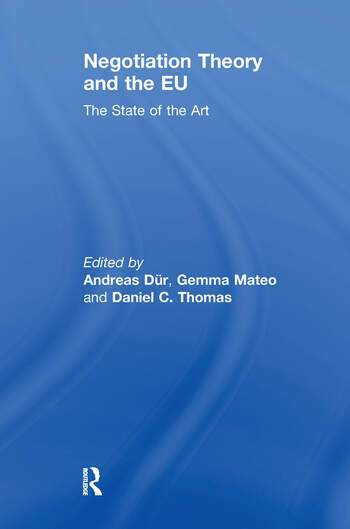 This volume offers a thematic and forward-looking survey of cutting-edge research on EU negotiation dynamics, identifying findings to date and setting an empirical and methodological agenda for future research. The chapters by leading international experts address a wide range of critical questions in this area, including: What factors influence negotiation behaviour and outcomes in the EU? How can we explain variation in the choice of negotiation styles? When do actors engage in arguing or bargaining? What are the determinants of bargaining power? What are the institutional foundations of EU negotiations? And what role does the presidency play in EU negotiations? The volume also discusses how the findings of the multi-disciplinary field of ‘negotiation studies’ can inform research on negotiation dynamics in the EU. The volume will be of great interest to established scholars and advanced students of international relations, European integration and governance, and negotiation analysis. This book was based on a special issue of Journal of European Public Policy. Andreas Dür is Professor of International Politics at the University of Salzburg. Gemma Mateo is Research Fellow at the University of Salzburg. Daniel C. Thomas is Associate Professor of European Governance and Director of the Dublin European Institute at University College Dublin.